Manifold tables can utilize the following data types for fields. Manifold geometry. geom is the native Manifold geometry type. geommfd is the equivalent written in binary for storage in external databases. Variable length Unicode text using UNICODE UCS-2 character set, two bytes per character. 2 GB maximum storage size for a total of 1 GB characters. A Manifold array of numbers of specified size, such as 128 x 128, where each number in the array is an allowed Manifold numeric type, including vector numeric types such as uint8x3. Universally Unique IDentifier (UUID), a 128 bit value represented by a text string of lower-case hexadecimal digits in standard form of groups of digits separated by hyphens. Each UUID is unique. Variable length non-Unicode text, one byte per character. 2 GB maximum storage size for a total of 2 GB characters. Dataports for databases expose all text fields as NVARCHAR (Unicode) even if they are stored as VARCHAR. Attempting to create a VARCHAR field will create it as VARCHAR on the database, but the field will look like an NVARCHAR data type in Manifold. What VARCHAR means varies between data sources and converting between different meanings frequently loses data, so this convention by Manifold helps to preserve data. Consider an example: In Manifold, VARCHAR means 'characters in the currently active codepage, whatever that currently active codepage may be.' However, in databases VARCHAR usually means 'characters in the codepage associated with the field / table / database'. If we connect to a database, we can ask it to return data as VARCHAR, and the database might return data in a German codepage if a German code page was used for that field. If we then try to use that data as VARCHAR in Manifold on an English system, the characters will be interpreted wrongly. That will affect both correct display of the characters as well as comparisons and orderings. Different client systems use different ways of dealing with such issues. Manifold 8, for example, allows setting a codepage for the field. However, the end result of such adaptations is to convert the data in all codepages different from the default code page into Unicode and then handle data as Unicode. If Unicode ends up being the intermediate form, it is better, as Manifold now does, to simply do the conversion as close to the data as possible. See related comments in the DBMS Data Sources - Notes topic. Why "N"varchar? - Why the n prefix for Unicode versions of varchar? Before Unicode got traction, character sets for different languages were known as National Character data sets. MySQL still calls these types national character and national varchar. 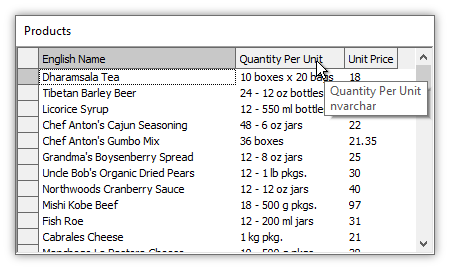 Manifold and SQL Server call these nvarchar (SQL Server adds an nchar type to match SQL Server's char type), and Oracle calls them nchar and nvarchar2. PostgreSQL and DB2 have char and varchar without "N" versions. See the Collations topic for more on how national languages are handled. Computed fields - Fields in tables can be computed fields, which automatically calculate a value for the field based on an expression. See the Example: Add a Computed Field to a Table topic for a step by step example. Geometry collections - Reading geometry collection values automatically merges individual values of the same underlying type used in Manifold geometry, such as area, line or point, with differences between subtypes such as line and multiline being ignored. The result of the merge is returned. This applies to all data which support geometry collection values, including WKB, GeoJSON, JSON, native geometry in database-specific formats, and so on. 3D conversions - Geometry values with mixed 2Dand 3Dcoordinates in GML, GeoJSON, and TopoJSON are automatically converted to 3D with 2D coordinates padded with zeros.